We all love a good subscription box don't we? There's something that's just so exciting about waiting each month to receive a box full of surprise goodies... Even if they're not for you specifically. What I mean by that is, if you didn't already guess from the photo and the title, I'm going to be reviewing a subscription box for my little pampered pooch, Ozzy. 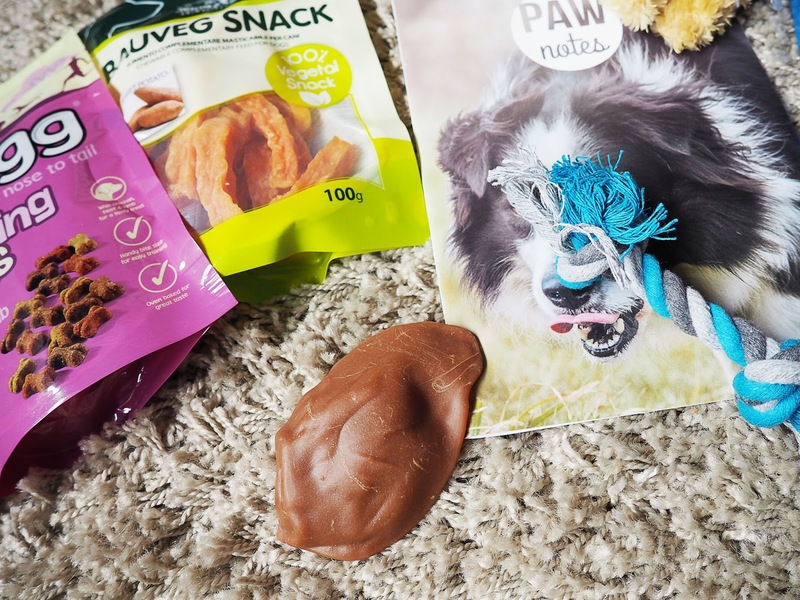 When Pawsome Box got in touch with me asking if I wanted to review their March box, I was so excited... I was probably more excited to open it than Ozzy. Sure enough, it arrived at my door last week and was greeted by one very sleepy and very curious doggy. 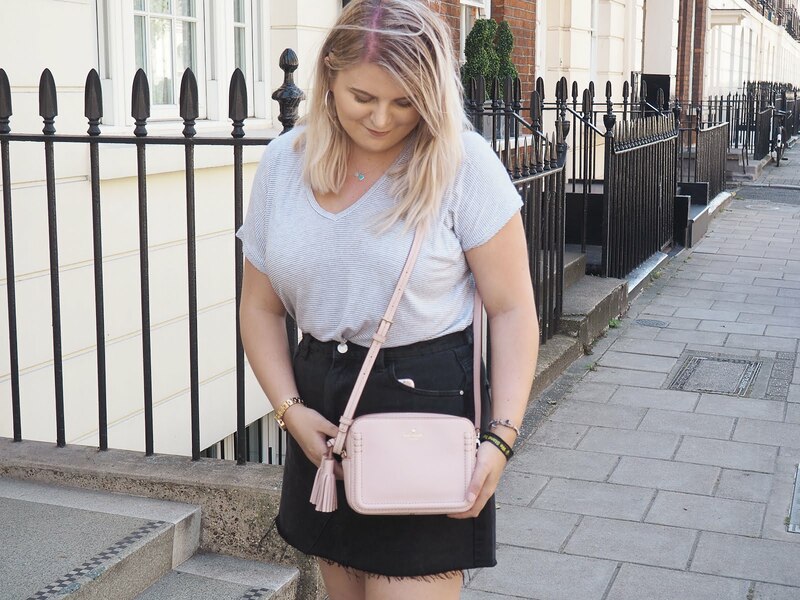 Before we get into what the box included, I want to tell you all a bit about why I love the brand so much. Although I think the boxes are quite costly at £19.90 a month (you can purchase months in bulk which works out cheaper in advance), everything in the box is catered specifically for your pet which I feel is well worth the money. What you receive is dependent on your pet's breed and age, I mean, how cute is that?! Oh, they also make lil subscription boxes for cats too! We can't have anyone feeling left out. But anyway, onto what I Ozzy got! P.S. At the end I have a discount code for you all. Each box comes with a little information leaflet which tells you a bit more about the brands and the products included that month. It's actually such a cute booklet and I think all subscription boxes should do something similar, instead of just a brief overview of the products. Ozzy was super excited to see that he received 3 food items in this box, the dog doesn't stop eating! Included was a "pig's ear" that is actually made from vegetables which was very reassuring as I never liked the idea of feeding him rawhide but he sure scoffed this down. Next up is a pack of Bauveg Sweet Potato Snacks and I won't lie, they absolutely stink haha! But Ozzy seems to love them so that's all that matters. 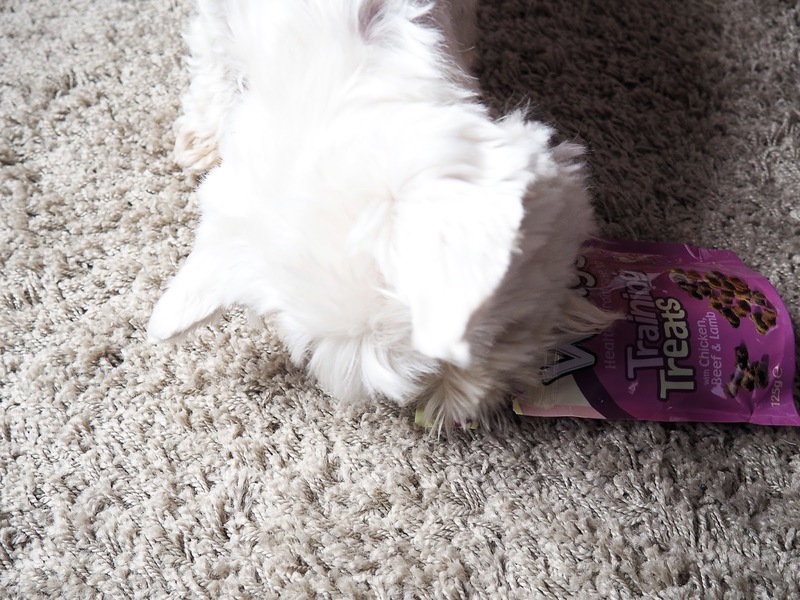 The final edible treat was some Training Treats by Wagg, I'll insert a picture of Ozzy with his nose straight in the pack but he absolutely loves any little biscuits. Ozzy is a bit old to be trained (plus he already is fully trained) but I can imagine they'd come in very useful for puppies, you know as like positive reinforcement. The March box consisted of 3 toys and a little grooming mitt. Ozzy adores being brushed but, as he's a Westie, his skin is quite sensitive so this mitt is perfect for him. It doesn't irritate his skin in the slightest and leaves his coat feeling super soft and looking extremely glossy. As my doggy is quite old, he's not the biggest toy fanatic. Saying that, he's obsessed with anything that squeaks so imagine how thrilled he was when he got two new toys that squeaked! 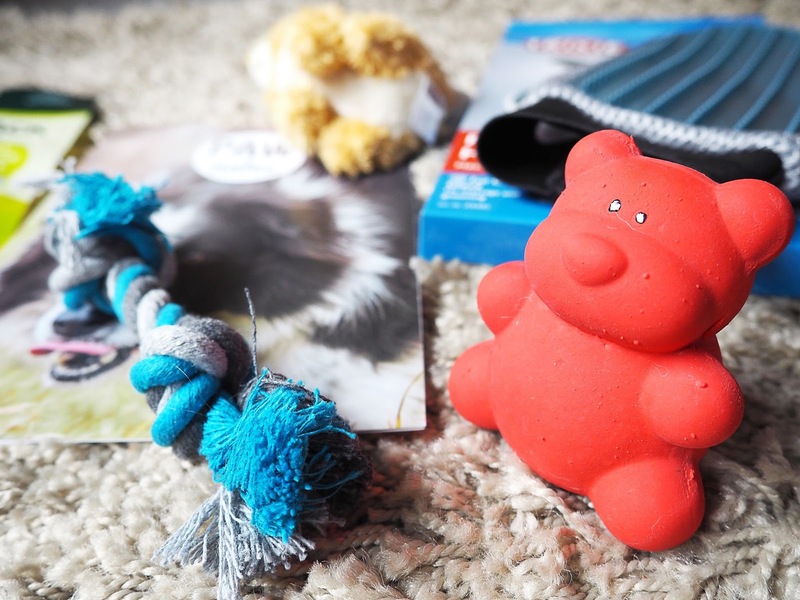 Ozzy received a squeaky bunny, a red rubber teddy and a rope toy. The squeak in the teddy was destroyed within an hour as he tends to go slightly crazy with them but he loves the bunny and sleeps with it in his bed! Adorable. 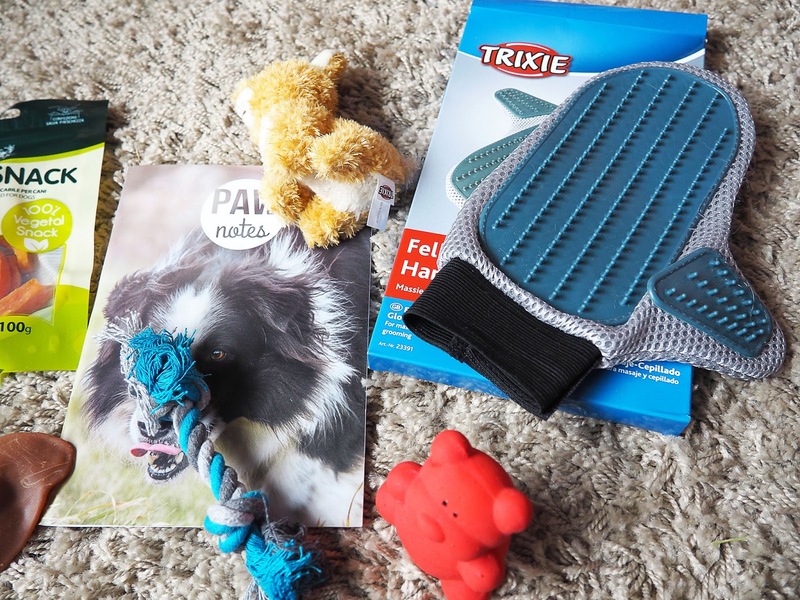 All in all, I'm extremely impressed with Pawsome Box and the products Ozzy received. I can't fault them as a brand and personally, I love this idea of a subscription box and I think they would also make a great gift for someone! Last but not least, use the code 'ukbfuyis' to get £5 off your first box. It's totally worth it. This is the CUTEST THING EVER... I bet Ozzy loved it too!! I really want to get one for my cat! I agree it is SO nice getting a subscription box... but one for your pet is EVEN BETTER!! Haha isn't it just?! He loved it! 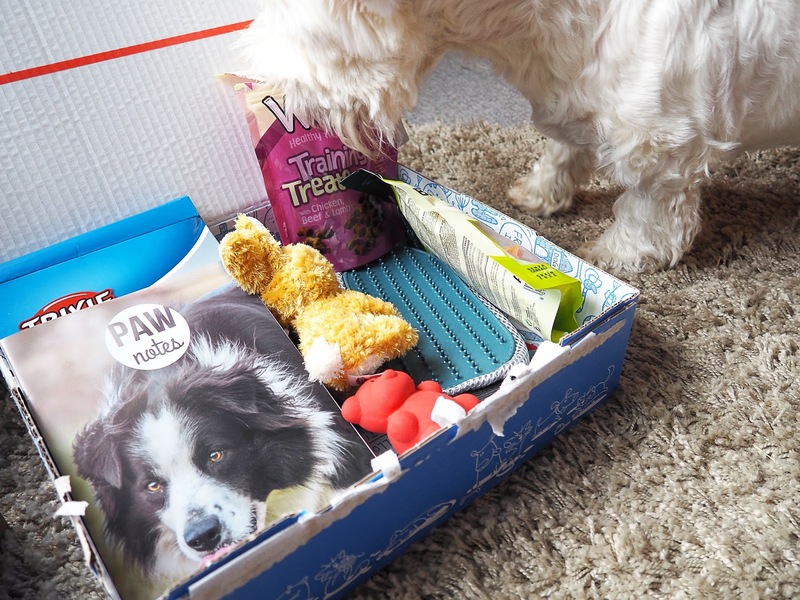 Aw this is so lovely, my dog would adore this package! 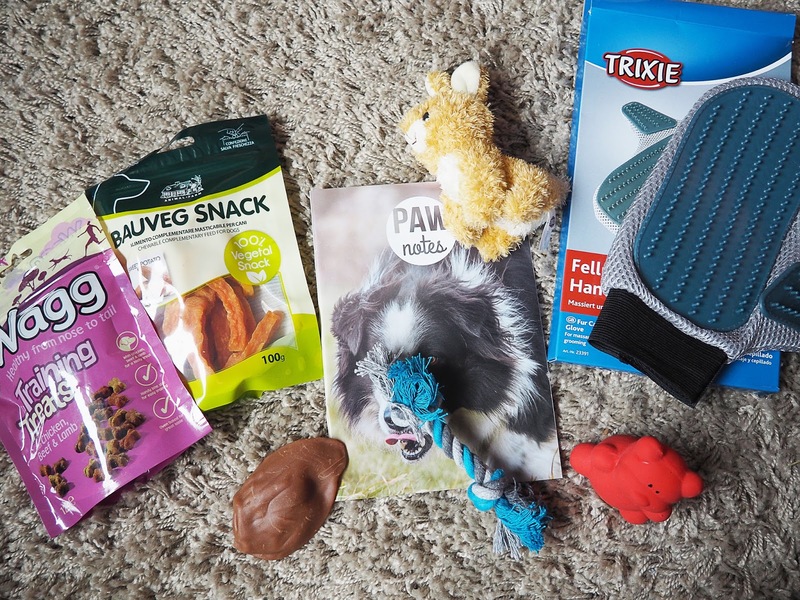 This is such a cute idea, I love the idea of a subscription box for furry friends. Too much cute. Me too! It's such a fun idea too, I can't believe there aren't more of them about! This is so cute, I'd love one for my dog! Those pigs ears are awful but at least the one in the box is made from vegetables haha! Omg I know, the actual pigs ears are horrible! I've never given my dog one before, mainly because they just freak me out haha! Awwww what a sweet idea! The box doesn't seem too pricey considered its tailored to your needs. I'm definitely gonna have a look at the cat one! Aww ozzy is adorable! This box looks fab, quite a few products for the money.